Recently, someone shared with me that she was once in a near fatal auto accident. But “luck” was on her side and she walked away with only a few scratches. She stated that what she realized about the experience was, unlike the typical realizations most have in such near-death circumstances – one of panic at not having accomplished what one has set out to do in life – was not her response. She realized from the accident that she did not have any regrets. She was living her life right on target. Admittedly, I am a lover of many things and even if I lived past the age of 100, I would not be able to get to it all done. I would need more than one lifetime to do everything I want to do and experience. I suspect that when my time arrives, I may not have full-blown regret, but I might be a bit bummed that the show is over. opportunity to meet and write about interesting people. In doing so, I get to live life vicariously through them. 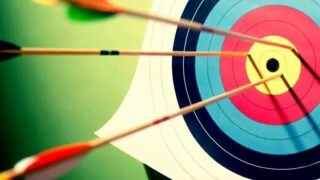 But more importantly, it helps me to focus more clearly upon the direction at which I choose to shoot my own arrows. In this week’s publication, I met up with fellow co-worker, Dave Harrigan (www.lifestyles.thewindhameagle.com/2018/03/time4printing-welcomes-multi-talented.html) as well as many family and friends of Catherine Bishop as they shared memories of her life (www.lifestyles.thewindhameagle.com/2018/03/the-party-must-go-on-honoring-life-of.html). One was the true adventurer, exploring the many corners of the world, while perfecting his artistic skills. The other stayed put in one place, carrying out her own creative and active life. The interesting thing is, neither seemed to have missed out – both living their life happily and right on their personal target. What I discovered in my interviews with both of these individuals is that although their arrows may have contained different colors and traveled at different speeds, the bull’s eye of all things significant was the same. A little faith with a lot of action. Dave often donned his wings and took flight in the direction of strange places. It took a little faith to charter unknown territory, especially the faith to act. Catherine was in action mode all of her life, much of which was given to the needs of others. In doing so, she relied on a little faith that all would work out just fine. At moments, Dave thought he needed to settle down and grow up, but in accepting where his life took him, he reached a pivotal moment in his life that helped him focus his skills that contributed to his success. With Catherine, what you saw was what you got. And that’s what people loved the most about her. Both Dave and Catherine honored their greatest gifts – their families, putting them first. Although Dave’s arrow may have taken some twists and turns while Catherine’s was more horizontal, they both aimed at life full steam ahead – without any regrets. As for me, I’ve been to Hong Kong, Japan and New York City and played slot machines in Las Vegas. All in less than 24 hours.